On Tuesday night Founders Brewing Company of Grand Rapids, Michigan, went head to head with some of the world's best Belgian style beers at Lyon Hall restaurant in Arlington, Virginia. When I heard that Founders would be featured at Lyon Hall, I could not pass up the opportunity to see how some of Michigan’s best beers would fare against some of the World's best. The Lyon Hall vs. Founders beer dinner featured a five course meal with each course accompanied by one beer selected by Lyon Hall's beer director David McGregor and one Founders beer selected by Jonathan McIntire of Founders. The diners then chose which beer better suited each course. 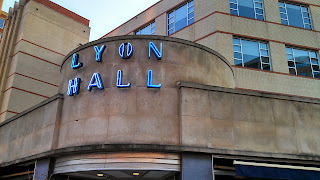 I had never been to Lyon Hall before, but I was intrigued by their website and several reviews I read online. Lyon Hall touts their "classic French brasserie cuisine" and their 23 beers on tap with another 50-plus in bottles. The restaurant is located on busy Washington Boulevard within a few hundred yards of the Clarendon Metro Station, making it easy to drink responsibly since patrons can just stumble outside to the metro or easily get a cab on Washington, Clarendon or Wilson Boulevards. Upon arriving, my wife and I were led through a bustling bar full of young professionals enjoying drinks after work. After passing through the bar, we were led to a smaller dining room upstairs that seats 36. We found McGregor waiting upstairs. His warm introduction immediately made it clear that this was going to be a relaxed dining experience. 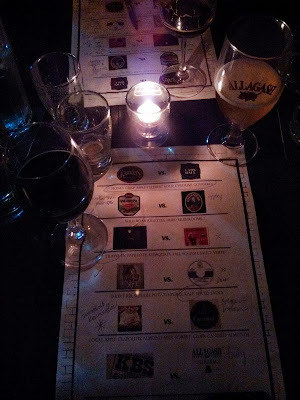 Our table was candlelit and had the menu with beer pairings laid out for us to peruse. After we were seated and the rest of the guests found their tables, McGregor and McIntire explained the format of the dinner. 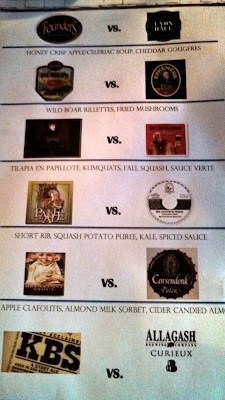 The goal was not necessarily to choose the best beer, but to pick which beer was a better match for each course. Both beer men encouraged the diners to take notes about the beers. Not being professionally trained in the art of beer tasting, my notes consisted of words like "chocolatey smooth," "airy," "small bite," and "Absolutely love this." During the first course, I looked over at the serious-looking beer connoisseur at the table next to ours and noticed that he had filled up most of the back of his menu with notes. Knowing I could not compete with his beer knowledge, I decided to just enjoy the beer and food and to keep my notes brief. The soup was delicious, and, as a huge cheese fan, I loved the gougeres, which are essentially fancy cheese puff pastries. As for the beer, I had a strong preference for Founders All Day IPA. It is not my favorite IPA, but the Unibroue beer was far too fruity for my taste. My wife, who generally does not like IPAs, enjoyed the All Day IPA and described it as smoother than most IPAs. The mushrooms were filled with wild boar rillettes (which is like a pâté) and then deep fried. They were served with arugula and a sweet dipping sauce. Luckily for me, my wife does not eat mammals, so I had a double serving of these mouth-watering treats. I am not typically a porter drinker, even though I am a big fan of the other dark beer, the stout. However, Founders Porter's full flavor is excellent. It is the beer that I described in my layman's terms as "chocolatey smooth." If I walked up to a bar and had to choose a beer for taste alone, I would choose the Porter over the St. Bernardus Prior 8. The Prior 8's lighter hints of fruit did not assault my senses like the Unibroue. It was the consensus of the diners that the dipping sauce (which neither McGregor or McIntire knew was going to be part of the menu) was the deciding factor in this round. For me, this dubbel's flavor complemented the dipping sauce and mushrooms better than the Porter. The tilipia itself was superb. Both the fish and the accompanying vegetables were wrapped in papillote (or parchment). I preferred the fish without the dipping sauce because it was cooked so perfectly that the sauce only covered up its natural flavors. I knew I would like the Founders Pale Ale and was not disappointed. I also was pleasantly surprised with the Laughing Dog. McGregor described it as kind of a starter sour...something to introduce a drinker of traditional beers to the world of sours. The first sip shocked my senses, but the beer gradually grew on me. McGregor picked a good introductory beer for a sour-virgin like me. It definitely inspired me to try more sour beers in the future. Despite a wonderful choice by McGregor, the smoother and less aggressive taste of the Pale Ale allowed me to enjoy the flavors of the true star of this course, the tilipia. The short ribs were cooked to my liking in that they were tender, but they did not have much taste outside of their natural meaty flavor. Of all the courses, this one was my least favorite. However, I did enjoy how the squash potato puree and kale tasted together. The Abbey Brown had no chance with me. The Founders Breakfast Stout, which is brewed with Sumatran and Kona coffee, is one of my favorite beers. My notes for the stout just say, "Absolutely love this!" The Abbey Brown was good though, in fact "very very good" according to my notes. Very, very good does not trump great. Since I had eaten my wife’s fried mushrooms and short ribs, I could not finish the dessert. I did have a few tastes of it though, and the sorbet was superb. The beer selections were manly, put-hair-on-your-chest choices. McIntire explained that Founders KBS is aged in oak bourbon barrels in gypsum mines. With an 11.2% alcohol by volume, it is not for the weak kneed. The Allagash Curieux also is aged in bourbon barrels and contains 11% alcohol by volume. Other than the barrel-aging and high alcohol content, the beers were very different. The Curieux was much lighter in color and sweeter than the dark stout. This was the closest choice for me, and I would happily drink both beers again (but in moderation because my knees aren't as strong as they used to be). After serious consideration, I slightly preferred how the darker stout contrasted with the sweet flavors of the dessert. My wife picked the Curieux, which was the only time she did not vote for the Founders brew. After the dinner was over, McGregor asked the diners to vote for their favorite beer for each course. Except for one course, each vote was very close. In the end, the other diners considered McGregor's choices to be better pairings by a vote of 4 to 1. Despite the final tally, both McGregor and McIntire were winners on this night. I was impressed by their knowledge of each beer and their laid back approach to the evening. They both were happy to answer questions about their selections and to ask diners why they made their choices. The biggest winner of the night was Lyon Hall itself. This restaurant serves excellent food and obviously is in the hands of a knowledgeable beer director. I will definitely check this restaurant out again, and I would encourage others to do so as well.